The youngest of three and a fifth-generation Kansan, J.R. Claeys was raised in a middle-class family in Salina, Kansas. It was there that his parents, Joe and Judy Claeys, instilled in him the value of hard work and an entrepreneurial spirit. Mowing lawns for the elderly on the weekends with his dad, J.R. learned the importance of service and community. J.R.’s father, Joe Claeys, was born and raised in Axtell, Kansas where his parents owned a downtown business. His parents were ranchers in Blue Rapids, Kansas before losing their livlihood in the Great Depression. J.R's grandfather weathered the depression by working for the railroad before settling in Axtell. J.R. tried his hand in the family trade, spending part of his summer working for Claeys Harvesting on his uncle’s combines, harvesting wheat in south-central Kansas up through northeast Colorado, before heading to K-State. J.R.’s mother, Judy, grew up in Salina, Kansas. Her father drove a dairy truck and later worked for Graves Truck Lines. J.R.'s grandfather also served in the U.S. Army in the Pacific during World War II. After raising four children, J.R.'s grandmother worked in the front office at Motor Service in Salina. J.R.’s parents met in Salina where his mother attended Marymount College and his father started work for Western Electric before serving in the U.S. Navy in Vietnam. J.R.’s father currently works as a technician for AT&T where he has over 45 years of service. His mother is a first grade teacher at St. Mary’s Grade School where she has taught children for over 25 years. After high school J.R. attended Kansas State University where he was involved in nonprofit student media and later worked for The Manhattan Mercury, receiving several state and national awards for his work. This is where J.R. first decided to pursue work in the nonprofit sector for charities and civic organizations. After the attacks of 9/11, J.R. became a founding member of a volunteer networking organization that matched volunteers with charitable organizations seeking help. At K-State, J.R. was recognized by the Manhattan City Council with a Community Service Award for his volunteer work with the Riley County Police Department and Crimestoppers. After graduating from K-State, J.R. went to Washington, D.C. to work in fundraising for the Republican National Committee. He went on to earn his Master of Public Administration degree from The George Washington University School of Business, where he studied nonprofit management. J.R. went to school at night while working as director of communications for the National Small Business Association (NSBA), a Washington, D.C. based small-business advocacy organization with over 150,000 member companies. There he advocated for reforms to encourage small business growth across America and was appointed as a U.S. Small Business Administration Office of Advocacy Judge with the Bush Administration in 2004. J.R. also served as the director of communications for the Small Business Exporters Association and the Small Business Technology Coalition. He was the spokesman for the Coalition Supporting Equity for Our Nation's Self-Employed, a coalition of business associations supporting tax fairness for self-employed health care costs, as well as the Small Business Coalition for Equitable Health Insurance, a coalition of businesses and trade associations supporting a market-based approach to health insurance coverage. From there, J.R. was selected as the President and CEO of the National Association of Government Contractors (NAGC), a trade association for small and midsize businesses involved in government contracting with over 400,000 member companies. J.R. has been an advocate for a fair and transparent procurement process and increased access to government contracts for small businesses. As president, J.R. assisted thousands of small businesses seeking work with federal, state and local government agencies. During election years he led massive Get Out The Vote campaigns to register new voters across the country, and helped get voters out to the polls on election day to vote for pro-business candidates. 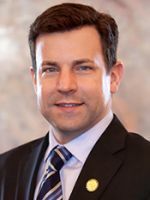 J.R. is quoted as an expert on small-business legislative issues in major publications, including the Wall Street Journal, USA Today, the Washington Post, the Chicago Tribune and many others. He has also appeared on national radio programs and television news channels representing small businesses throughout the country. J.R. is a certified international elections observer, having served as a volunteer in a young democracy grappling with voter fraud issues and the implementation of Voter ID programs to secure citizen ballots. J.R. has the experience to implement real reforms to keep our elections fair and prevent voter fraud in Kansas. As recently as March 2009, J.R. worked to stop voter fraud in El Salvador's presidential elections. At his voting center a Nicaraguan was caught trying to vote illegaly, attempting to steal the vote of an eligible voter. J.R. advised the country's electoral tribunal on the changes necessary to prevent future voter fraud, helping reform the electoral process of a nation. J.R. is also a supporter and volunteer with the Kids Voting Kansas Program, an organization that teaches kids the elections process by allowing parents to bring their school-aged children with them to the polls to learn how to vote. In addition to election issues, J.R. is a strong supporter of education and conservative principles, J.R. served as a board member and later chairman of a national nonprofit conservative organization that offers scholarships to college-bound students involved in promoting conservative causes on college campuses. Continuing his commitment to promoting conservative principles, J.R. now serves on the executive board of the Kansas Young Republicans. J.R. currently lives in Salina and owns a small business that helps nonprofit organizations with their fundraising efforts. J.R. has traveled to every corner of the state (MAP), listening to Kansans, and sharing his ideas for growing jobs and securing our elections from fraud. As Kansas Secretary of State, J.R. Claeys will cut red tape for small businesses and run free and fair elections for Kansas. Whether it's encouraging civic participation in elections, securing our vote or changing the business climate to promote economic growth, J.R. continues to speak out on the issues important to Kansans.